Book Smarts: What’s on Your Wall Shelves? One of the things I love to do when I visit someone’s home is peruse their wall shelves or book cases. Not only do I discover my friend’s interests in books, I gather information about the things in their life they find important. Do they have books of a certain genre? Do they display a collection of items? Is there balance between spaces on the shelves where my eye can rest vs. spaces that contain something? As you know, we just returned from the High Point Furniture Market and one of the coolest new implementations of a tried and true home decor idea was using covered “books” as design elements on wall shelves. Two displays from a vendor booth really caught our attention. 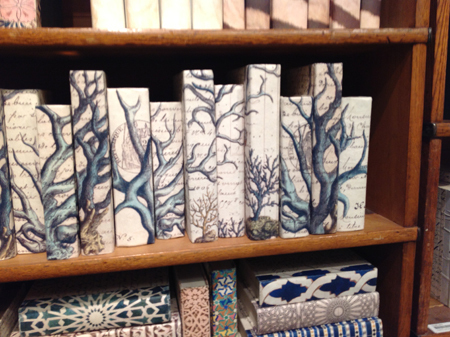 These decorative books tell a story that will captivate. 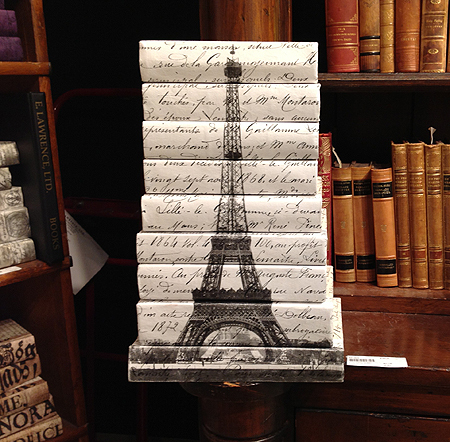 A little Paris in your home! When deciding how to place items in your bookshelves, the style of the shelving unit itself plays a part. 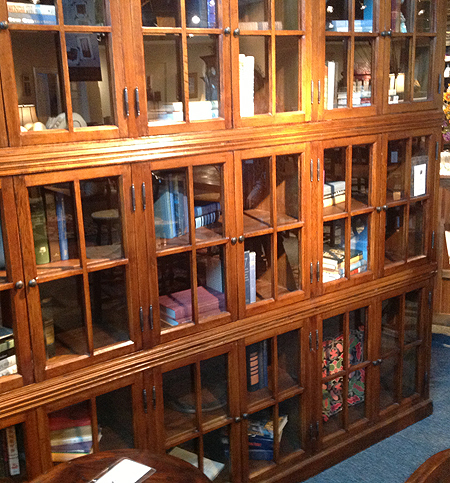 Are your bookshelves more in line with vintage furniture? Or are they sleek with a modern appeal? How can you play with items of meaning to you while giving a nod to your own interior design aesthetic? Wall shelves and book cases harbor endless possibilities when it comes to home decor. Whether you have your personal reading collection, decorative books, or display cabinets of your favorite treasures, each item you choose to place on your bookshelves should be thoughtfully selected. Where can I purchase the Eiffel Tower decorating book tower featured here? These were seen at a wholesale vendor in High Point, NC at the Furniture Market in 2012. Unfortunately the vendor doesn’t show at the market anymore, and I am not sure where they are in business. I do know these were just regular old books that you can pick up in a used book store, then wrapped with a section of Eiffel Tower wall paper cut to fit the books like a jacket. Fairly easy DIY project if you can find some Paris style wall paper.